Gothic Arch Greenhouses Inc provide a huge selection of the highest quality and lowest priced greenhouse covering. 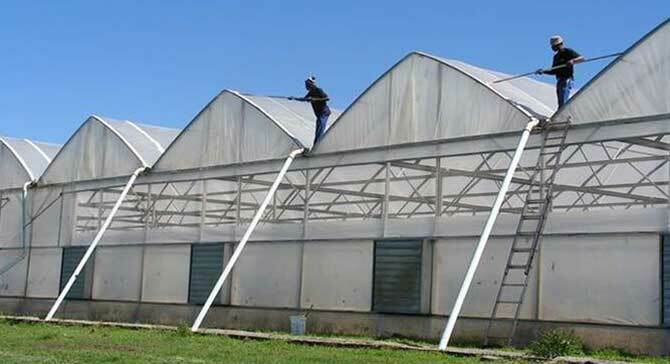 We offer greenhouses polycarbonate, greenhouse polyethylene films, Greenhouse fiberglass, greenhouse poly films and acrylic panels. 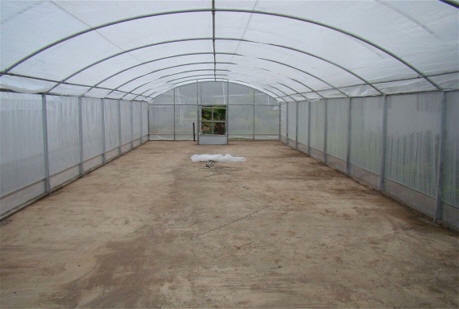 Multiwall Polycarbonate: Multi wall Polycarbonate is available to give long-life, heat-saving covers. These covers have two layers of rigid plastic separated by webs. The Multi wall material retains more heat, so it can save more energy. Corrugated Polycarbonate-Dynaglas: DYNAGLAS Corrugated Polycarbonate is available for any commercial greenhouse application in multiple tints, including clear, SolarSoft™, white/opal, and solar gray. DYNAGLAS polycarbonate sheets offer all the benefits of polycarbonate glazing, such as high impact resistance, excellent durability, and 99.9% UV blocking. DYNAGLAS Corrugated Polycarbonate PLUS features built-in condensate control that carries a 10-year warranty. Greca Corrugated Polycarbonate: Our Corrugated Polycarbonate is leading materials of choice for greenhouse roofing due to its unique combination of characteristics. It is a high quality, lightweight, rigid corrugated polycarbonate sheet, with excellent impact resistance, superior clarity, versatility, and weather resistance. Greenhouse Poly Films: Poly Film coverings are available in several grades of quality and several different materials. Poly film costs are very low because the frame can be lighter and plastic film is inexpensive. Light transmission of these Poly Film coverings is comparable to glass. Fiberglass Roll: Our fiberglass roll provide excellent transmission of light and solar energy. They with stand heavy snow and wind and are resistant to breakage, hazing, sagging and impacts from hail or vandals. is rated at about 5 oz. thick, about the thickness of a quarter. It has a warranty from the manufacture of 10 years, but if taken care of meaning cleaned annually, use of a shade cover during the sunnier, warmer months, you might can push between 10-15 years out of it. Acrylic Panels: DEC acrylic glazing provides an excellent setting where the grower is in control and doesn’t have to react to changing conditions. With our acrylic products there’s no need to change growing techniques to offset declining light levels due to yellow, deteriorated coverings. Growers can also make the most out of their investment in computerized control systems. DEC acrylic glazing patented NO DRIP™ technology increases light levels during typical condensate conditions and greatly reduces droplet damage to plugs and blooms. Griffolyn Covers: Use Griffolyn® for Corrosion Protection, Equipment Storage/Shipping Covers, Landfill Covers, Vapor and Moisture Barriers, Dust and Environmental Partitions, Contaminated Soil Covers, Athletic Field Covers, Greenhouses, Crop Protection or any of a thousand other possibilities. Eskay Lite Vinyl-Greehouse Covering: Eskay Lite is a crystal clear, 16-mil vinyl covering to be used as a greenhouse cover where appearance and visibility are important. Used on the ends and sides of polyethylene greenhouses, Eskay Lite is attractive and allows customers to see into the structures. This material is treated to be flexible to - 40 degrees F and has a U.V. inhibitor that gives a 4-year life under most conditions. Solexx-Greenhouse Coverings: The newest greenhouse paneling material sets a new standard for durability, longevity, and ease of installation. Solexx Paneling is a sturdy twin-walled material made from an advanced formulation of polyethylene. Solexx Paneling is UV certified by an independent lab and is backed by an eight year warranty. Polycarbonate Accessories: Polycarbonate Accessories offer Aluminum Tape ,V Porous Tape, Washers, Sealant, Polycarbonate U-Profile, H-Profile, Polycarbonate Snap-H Profile, Snap-U Profile, Polycarbonate Ridge Profile, Aluminum H-Profile, Aluminum U-Profile, Screw.